Copycat Peanut Butter Sandwich Cookies | These fun shaped cookies will remind you of your favorite store bought Nutter Butter Cookies. While I do love me some Nutter Butters there’s nothing like biting into this homemade version. 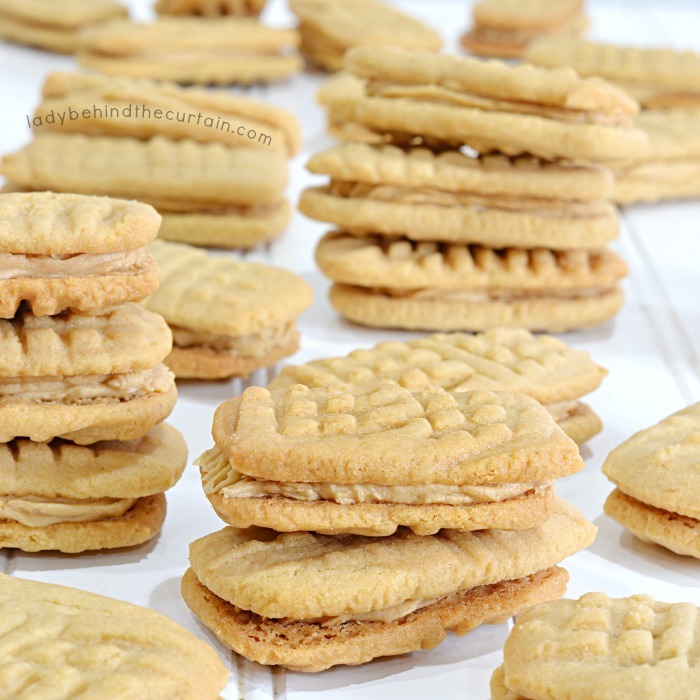 Every Christmas cookie tray should have some Copycat Peanut Butter Sandwich Cookies! 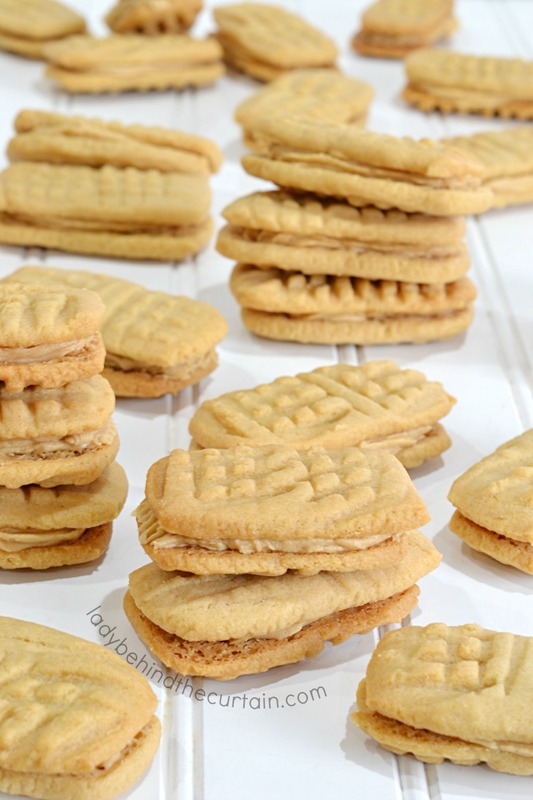 With a creamy sweet peanut butter filling that is addictive all on its own. Your family and friends will be running to you for the recipe! Now, if you would like to change it up a bit you could totally use chunky peanut butter to really drive home the peanut flavor and add more crunch to the cookies. I would add the chunky peanut butter to the cookie batter and not the creamy peanut butter filling. Double the recipe! 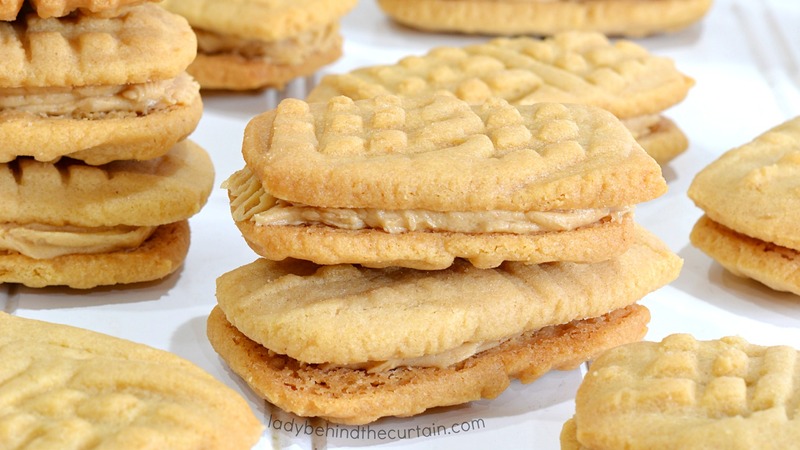 These Copycat Peanut Butter Sandwich Cookies will go fast! This recipe has been in the family for many generations and was passed down to me when I got married. I have been making these delicious cookies for Christmas Day ever since. It’s a tradition that I plan on handing down to my children. While this cookie recipe has been in my family for many years let me introduce you to a cookie recipe that has been in my husbands family for many years. Grandma B’s Persimmon Cookies, This cookie recipe has a whole cup of persimmon pulp and all the warm spices of the holiday season. These thick moist cookies are more like a slice of quick bread then your typical cookie….another cookie we have every year! Are you creating a cookie tray this year for Christmas? Here are some of my favorite cookies I put on my Christmas Cookie Tray. PECAN SANDIES WITH PRALINE FILLING, BROWN BUTTER GLAZED PECAN CRESCENT COOKIES, COFFEE SHOP BROWNIE MIX BISCOTTI, CLASSIC SUGAR COOKIE RECIPE, and LOADED CHOCOLATE CHIP PRETZEL COOKIES. DON’T SEE WHAT YOU WANT? Click here for over 90 RECIPES—->>>>COOKIE RECIPES. Whisk together flour, baking soda and salt; set aside. Place butter, peanut butter and both sugars in the bowl of an electric mixer. Beat until light and fluffy. Add the egg and vanilla, beat to combine scraping down the sides of the bowl. With mixer on low, add the flour mixture, beat until incorporated. Wrap in plastic wrap or place in a bowl with a lid and refrigerate at least 30 minutes or overnight. Preheat oven to 325°. Line two cookie sheets with parchment paper. On a slightly floured work surface roll out dough to 1/4-inch thickness. Using a sharp knife, cut dough into 2 1/2 X1-inch rectangles. Using the tines of a fork, score the cookies. Gather up scrapes and continue to make the rectangles until all the dough is used. Place cookies in the refrigerator about 15 minutes or until firm. Bake 15 to 20 minutes. Transfer to a wire rack to cool completely. Using an offset spatula, spread 1 tablespoon of filling onto the flat sides of half of the cookies. Sandwich with remaining cookies, keeping the flat sides down. OR.....Spoon the filling into a piping bag and pipe on the filling. In bowl of an electric mixer, whip together the butter and peanut butter until light and fluffy. Add the powdered sugar and continue to beat until fluffy. Spread or pipe on cookies. More peanut butter cookies you might like. TRIPLE CHOCOLATE PEANUT BUTTER SANDWICH COOKIES and PEANUT BUTTER SANDWICH COOKIES WITH VANILLA CREAM FROSTING.